I recently picked up my (inherited from my father) 36-year-old copy of a 100-year old story thinking I could, based upon my enjoyment of the recent film (a film people seem to really like or really hate), blow through it in a few evenings. How wrong I was. I really, really, really wanted to like this classic sci-fi/fantasy series starter from one of the "greats", but too many of the reservations that kept me from reading it when I was younger proved to be true. Burroughs had some outstanding ideas, but he was a product of his time, and his prose and characterization suffered for it, and that takes some of the shine off this story from a contemporary setting. Burroughs apparently read some pulp sci-fi/fantasy early in his career and decided he could do better than that bad fiction, and he probably has, but I can't imagine how tedious a "bad" story might have been in his era. Ignoring all the (now) ridiculous scientific premises of the time that served as the foundation for speculation that life could exist on Mars (most notably, the canals of Mars), and a life that had flourished for a long, long time, Burroughs puts together an intriguing Man Outside His World, Yet Pretty Much Still in His Element story. John Carter, manly man, is transported from one world of war to another, which suits him. Unfortunately, the book alternately (and maybe out of necessity) reads like a travelogue of exasperating descriptions and needlessly detailed dialogue. For the better part of the story, there's not much impetus driving it forward, no mission for Carter other than to look about, succumb to a murderous impulse (which he, in a fit of blinding hypocrisy, impugns in the Thark character, though he justifies it as an exhibition of human compassion--even though this is equally a mark of his societal norms as is the cruelty of the Tharks), and record what is happening around him. 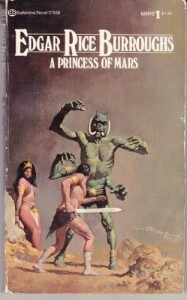 Burroughs creates some fascinating creature characters, even though their nature seems to be informed by misconceptions about the mindless savagery of Native Americans and impeccable nobility of European Americans (the former are encountered once and their behavior is mimicked by Martian Thark culture). In some of these characters he boldly paints a few oddnesses, such as a compassionate Thark, which could not have entirely been a mechanism to create a guide since Deja Thoris was clearly as familiar with the world as oddball Thark, Sola. Apart from this, characters are pretty thin. Carter himself is a man's man's man. He alternates between exasperatingly gentlemanly and abruptly violent, which makes him, from a contemporary point of view anyway, alternatively tedious and quasi-heroish-but-ultimately-too-frequently-impulsive-to-be-considered-a-safely-reasoning-guy. The story is pretty short, clocking in on my father's 1976 printing at 159 pages, but good heavens it could have been 50 pages shorter on account of ditching some swoony flirting between man's man's man, John Carter, and petulant pay-attention-to-me-without-paying-attention-to-me princess, Deja Thoris, and snooze-inducing formal dialogue that attempts to pack as many words into a single thought as possible. I did not hate this story, but I did find it frequently tiresome as it clung to the thriftless holdovers of storytelling from the century before (e.g., why use 3 words when you can use 30? ), an indulgent style of writing that when used now seems like an attempt by the writer to prove their own verbosity at the expense of the story. Any author who wrote in this fashion would be seen as trying to deliberately alienate themselves from their readers. Writers have since become much more clever in their storytelling (popular writers, who don't understand that you can sometimes cut too much, are another matter). This story gets points for its classic nature, its imagination, but loses some for its frequent blandness, stereotypical characters, and ship-at-anchor pacing. To Burroughs credit, it seemed clear he had the end in sight from the get-go, I just wish it hadn't taken so long to get there. Respect, Edgar Rice Burroughs. I love the concept, not so much the execution. Maybe the next few will be better. It behooves me to mention the recent film, (which, to my surprise, I enjoyed a great deal) released on roughly the centennial anniversary of story's 1912 publication. I can say without hesitation that the film improves upon the story in almost every way, largely by cutting out the chaff, providing impetus for the story, removing antiquated mindsets, fleshing out characters (most notably, Thoris is a scientist and accomplished warrior in addition to being a strong-minded and patriotic princess), injecting a bit of humor, and putting greater emphasis on Carter's superhuman characteristics, to the amusement of viewers.